Bulk SMS is the process of sending large number of SMS to different groups of people at different locations. 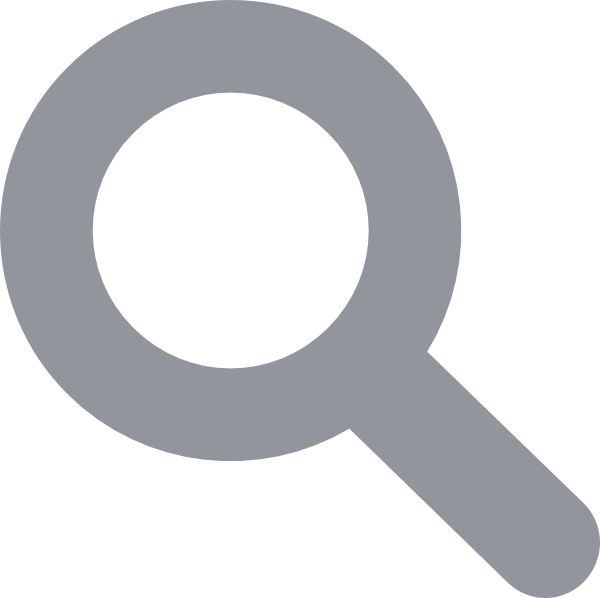 They can be used to convey important information or used for promotional purposes. It is a very effective tool as SMS has 98% open rate and is read within 5 minutes of delivery. Below we have described the process of sending Bulk SMS. 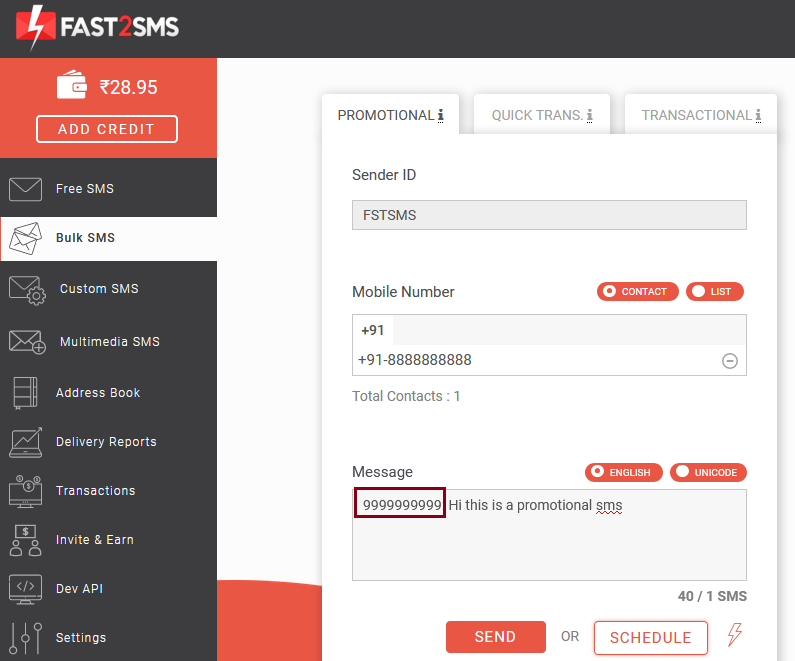 Quick Transactional – This route is newly launched by Fast2SMS. In this route you have to get each SMS template approved by us. 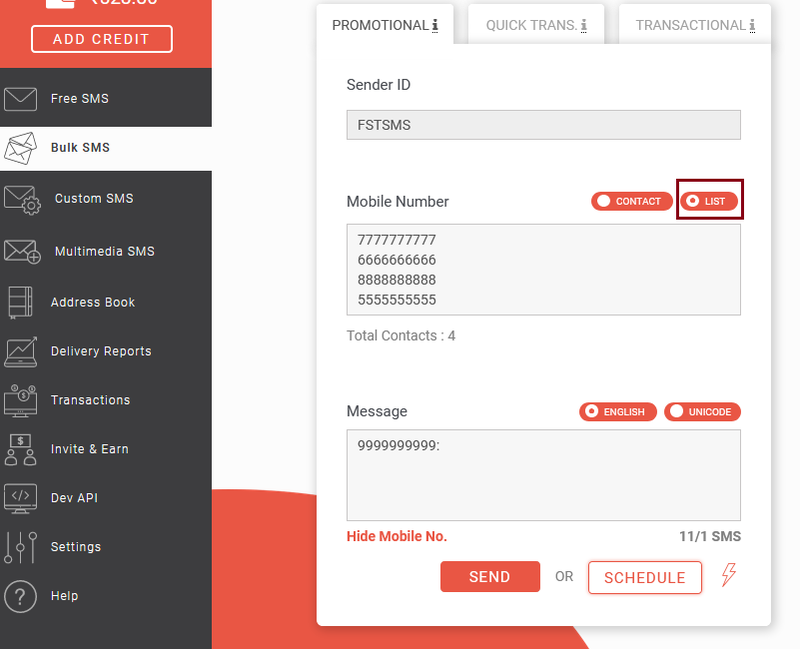 After that you can send the approved SMS templates to non DND and DND numbers. SMS should not be promotional. Here you don’t need to submit document for verification. Click here to know in detail about Quick Transactional route. Once you click on the ADD NEW button, the following screen will show up on the screen. Click on the I AGREE TERMS & CONDITIONS button to proceed further with creating sender ID. You can select the CONTACT button to enter one mobile number like shown below. If you wish to add more mobile numbers then select the LIST button. In the image below, we have entered 4 mobile numbers. If you wish to hide your mobile number, click on Hide Mobile No. Type your message in the message box. By default English tab is selected, if you wish to send message in language other than English, select the Unicode tab. Once you have written the message in roman, press space. Automatically it will convert it in the language you wish to send the SMS. Here we have selected Hindi language. Once we have written the message and press space, it gets converted into Hindi as shown below. 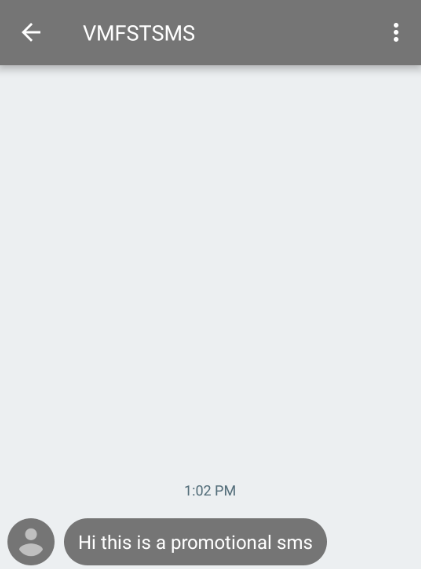 You can also drag and drop the SMS the previously sent messages. 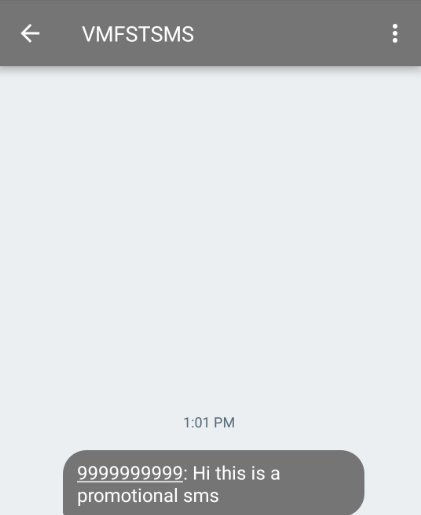 If you want to send the same SMS again which you have sent earlier, simply you can drag the message from the Previous Messages option and drop it to your message box like described below. As shown in the image below, we have to select a previously sent message like Hello, how are you?, drag it to the message box and paste it there. After dropping that message in the message box, it will appear as shown below. Now the message is ready to be sent. After you have written your message press send. You can send Flash SMS by clicking on the icon next to schedule button. 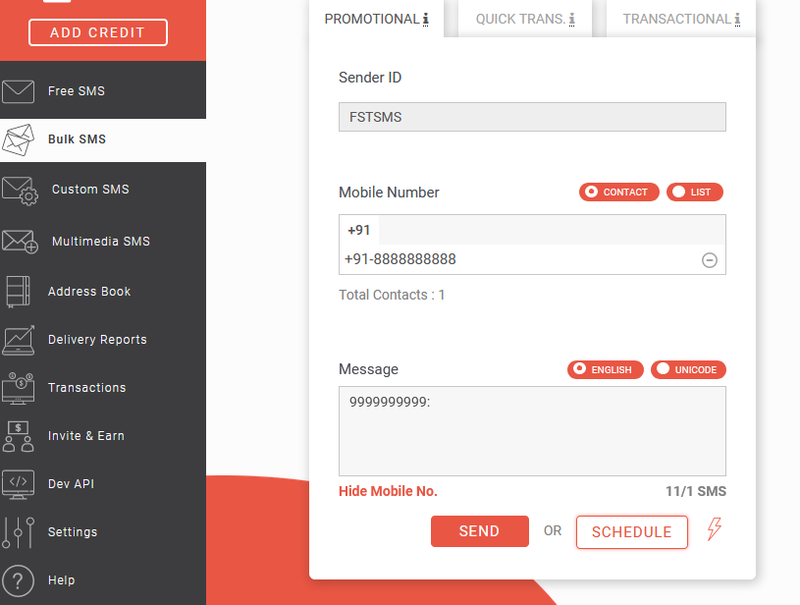 Flash SMS appears automatically on the receiver’s mobile screen without any user interaction. Click here to know in detail about Flash SMS. When you click on the icon highlighted with red color, flash will get enabled. Now you can send Flash SMS. At the top of the screen message will be displayed that Flash SMS is enabled. To disable Flash SMS click on that icon again. This is how Bulk SMS works. Note : If you are sending Bulk SMS from promotional route after 9 PM, then a warning message will be displayed. 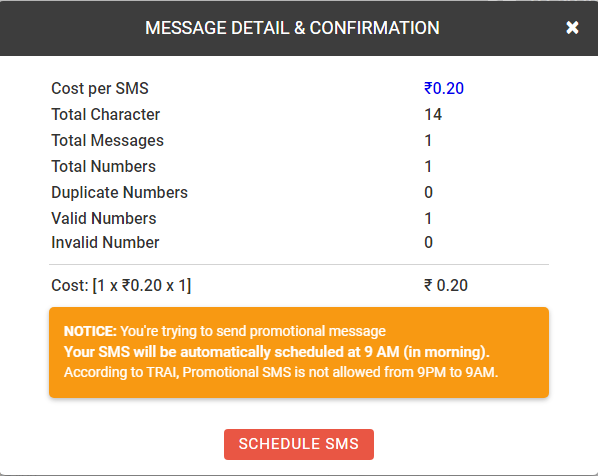 As per TRAI rules, promotional SMS is not allowed from 9 PM to 9 AM. Your SMS will be automatically scheduled for the next day at 9 AM. The warning message will be displayed as shown in the image below. Below is an example of how to send bulk SMS. In the below example, we have first selected the sender ID, then entered the mobile number. After that typed the message. When we press the send button, a confirm dialog box will appear. 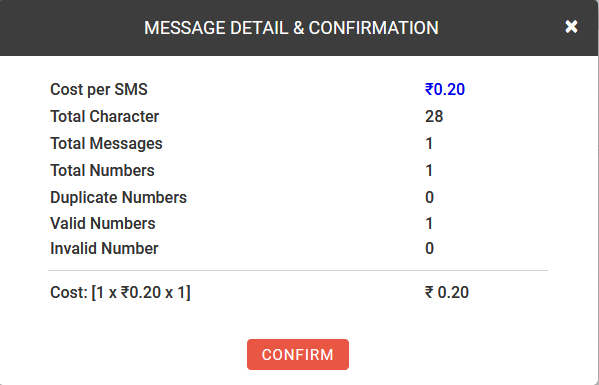 Confirm dialog box will have all the details regarding your SMS. 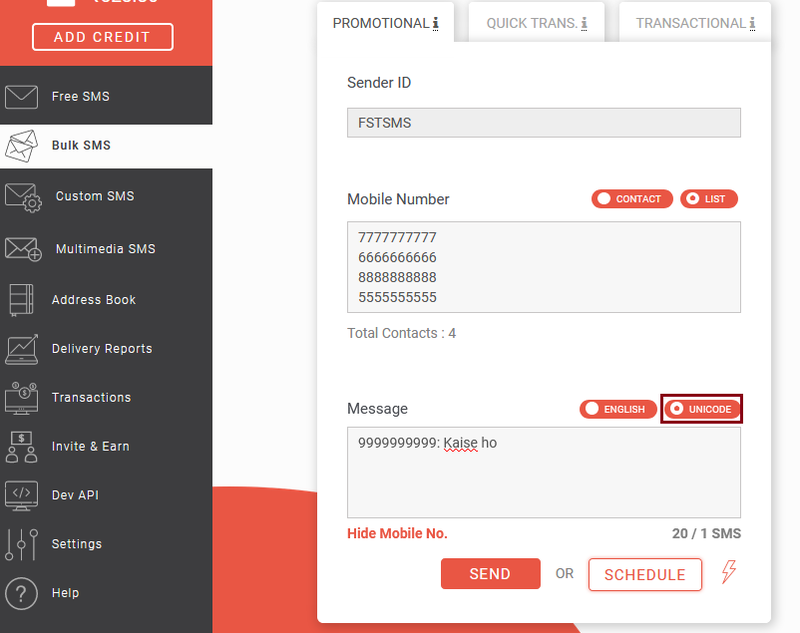 It will describe details like cost per SMS, total characters, total numbers, etc. Click on the confirm box to sent the message. There is a character limit for each SMS. It is different for Unicode and for English SMS. A message will be displayed that your SMS is successfully sent. You can activate premium membership to hide your mobile number. If you have activated premium membership, then your mobile number will not be shown in the SMS. In the below image mobile number is not displayed as they have subscribed to premium membership. Note: This feature will only work in bulk SMS, it will not work in free SMS. Check delivery report after some time. To see delivery report of the SMS which you have sent, click on the Delivery Reports option on the left side. All your sent SMS will appear here. Click on the message to open it and view its status. To know more about Delivery Reports, click here. You can even schedule the SMS to be sent at a later date. To schedule the SMS, click on SCHEDULE, then select the Date. You can select multiple dates as well for sending the SMS at multiple times on the future dates. 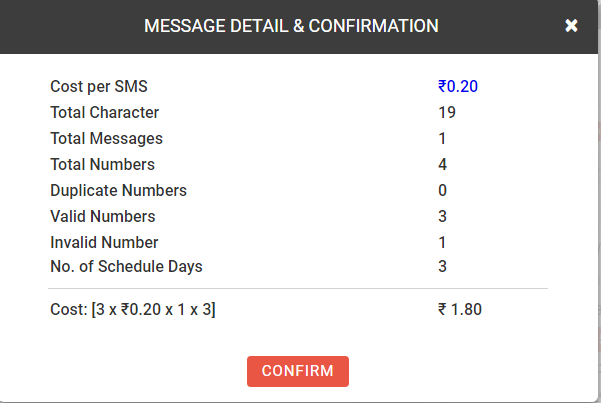 If you want to schedule the SMS for one time then select ONE TIME else select MULTIPLE. Below we have described about scheduling SMS on multiple dates. In this example we have scheduled our SMS for the dates 15th, 16th and 17th August and set the time as 2 PM. After selecting the required date and time, click on the SCHEDULE button. The message gets scheduled for that particular date and time. So if you want, you can schedule the SMS or send the SMS instantly by pressing the send button. When you click on the Schedule button, following screen will pop up. Click on Confirm. Select Yes Cancel button. Once you select it, a dialog box will appear stating that schedule bulk SMS has been canceled successfully. If suppose you have scheduled a promotional message to be sent after 9 PM, then a warning is displayed as shown in the image below. 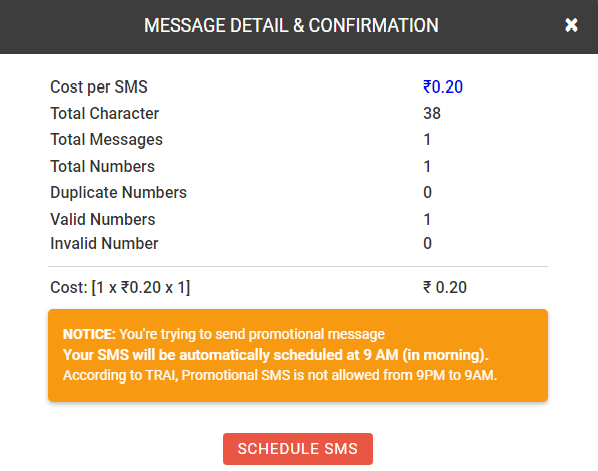 As per TRAI, you are not allowed to send promotional message from 9 PM to 9 AM. Your SMS will be scheduled automatically at 9 AM(next morning). Press Schedule SMS if you want to send the SMS. If you want to cancel the scheduled SMS, you can do it so by visiting the Delivery report section, then select the schedule tab and then click on the Cancel SMS option. Money charged for that SMS will be refunded in your Fast2SMS wallet.